John Thelwall, the son of a silk mercer, was born in 1764. He first became involved in politics when he campaigned on behalf of John Horne Tooke in the in the 1790 Westminster election. He also joined Tooke's Society for Constitutional Information. Two years later Thelwall helped Thomas Hardy to form the London Corresponding Society. As well as campaigning for the vote, the strategy of the London Corresponding Society was to create links with other reforming groups in Britain. Thomas Hardy was appointed as treasurer and secretary of the organisation. The society passed a series of resolutions and after being printed on handbills, they were distributed to the public. These resolutions also included statements attacking the government's foreign policy. A petition was started and by May 1793, 6,000 members of the public had signed saying they supported the resolutions of the London Corresponding Society. At the end of 1793 Thomas Muir and the supporters of parliamentary reform in Scotland began to organise a convention in Edinburgh. The Society sent two delegates Joseph Gerrald and Maurice Margarot, but the men and other leaders of the convention were arrested, tried for sedition. Several of the men, including Gerrald and Maragot, were sentenced to fourteen years transportation. 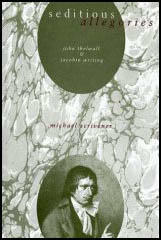 The reformers were determined not to be beaten and John Thelwall joined with Thomas Hardy and John Horne Tooke to organise another convention. When the authorities heard what was happening, the three men were arrested and committed to the Tower of London and charged with high treason. The men's trial began at the Old Bailey on 28th October, 1794. The prosecution, led by Lord Eldon, argued that the leaders of the London Corresponding Society were guilty of treason as they organised meetings where people were encouraged to disobey King and Parliament. However, the prosecution was unable to provide any evidence that Hardy and his co-defendants had attempted to do this and the jury returned a verdict of "Not Guilty". Society Meeting' at Spa Fields in London (signed 16th November, 1795). 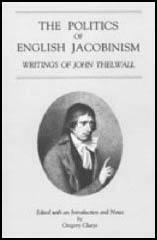 The government continued to persecute John Thelwall and other supporters of parliamentary reform. Habeas Corpus was suspended in 1794, enabling the government to detain prisoners without trial. The Seditious Meetings Act made the organisation of parliamentary reform gatherings extremely difficult. At one public meeting addressed by Thelwall, on 26th October 1795, in Copenhagen Fields, it was claimed that over 150,000 people were in attendance. Although watched by government spies, Thelwall continued to give twice-weekly lectures in favour of political reform. These speeches were also published in Thelwall's journal, The Tribune. Thelwall also found time to write a book Rights of Nature that was published in 1796. In later life Thelwall concentrated on journalism and in 1818 purchased the journal The Champion. The following year Thelwall was active in the protest meetings that erupted after the Peterloo Massacre. John Thelwall died on 17th February 1834. (1) John Thelwall, speech made at Copenhagen Fields in Islington in 1795. I do not mean equality of property. that is totally impossible in the present state of human intellect and industry. The equality I mean is equality of rights. The equality which protects the poor against the insults and oppressions of the rich, as well as the rich against the insults and invasions of the poor. Perhaps before twilight information may be lodged at the Privy Council that I am making an inflammatory harangue to persuade you to level property and murder all the proprietors. But I have taken care, by having a shorthand writer at my elbow, that they shall not be able to prove me to have said anything that I do not say. I affirm that every man, and every woman, and every child, ought to obtain something more, in the general distribution of the fruits of labour, than food, and rags, and a wretched hammock with a poor rug to cover it; and that, without working twelve or fourteen hours a day from six to sixty. They have a claim, a sacred and inviolable claim to some comfort and enjoyment to some tolerable leisure for such discussions, and some means of or such information as may lead to an understanding of their rights. The fact is that the hideous accumulation of capital in a few hands, like all diseases not absolutely mortal, carries in its own enormity, the seeds of its cure. Man is, by his very nature, social and communicative - proud to display the little knowledge he possesses, and eager, as opportunity pretends, to increase his store. Whatever presses men together, therefore, though it may generate some vices, is favourable to the diffusion of knowledge, and ultimately promotive of human liberty. Hence every large workshop and manufactory is a sort of political society, which no act of parliament can silence, and no magistrate disperse. Lift up your voices. Wear not your lungs with sighs and sullen murmurs. Exert once more the manly energies of reason; and tell them, with a clear and decided tone, that "peace is not peace without reform" and "your discontents can never be allayed without the restoration of equal rights and equal laws".